(TORONTO, ON. – August 25, 2014) Whether it’s for work or for fun, the 2015 Toyota Tacoma is the pick-up truck that does more. Tacoma is Canada’s top-selling compact pick-up truck, and with eight models offering a choice of drivetrains, transmissions, cab and bed sizes – plus a broad choice of available upgrade packages – there’s a Toyota Tacoma for every need. Starting with this rock-solid foundation, the Tacoma is the compact pick-up truck that’s further defined by choice. Canadians can choose from: four-cylinder or V6 engines; manual or automatic transmissions; 4x2 or 4x4 drive trains; Access Cab or Double Cab configurations; and five-foot or six-foot cargo beds. Four-cylinder Tacoma models feature a 2.7-litre engine that develops 159 peak horsepower and up to 180 lb-ft of torque, coupled to a choice of five-speed manual transmission or four-speed automatic ECT transmission with lock up torque converter. Four-cylinder models feature the four-person Access Cab and a choice of 4x2 or 4x4 drivetrains. For more power, Tacoma models equipped with Toyota’s 4.0-litre V6 generate 236 peak horsepower and up to 266 lb-ft of torque, paired with either a six-speed manual transmission or five-speed Super ECT automatic transmission with lock up torque converter. V6 Models feature 4x4 drive trains and a choice of four-person Access Cab or five-passenger Double Cab. All engines feature Variable Valve Timing with intelligence, Sequential Multiport Electronic Fuel Injection, Electronic Throttle Control System with intelligence, and other systems to maximize power and efficiency under all load conditions. Heavy-duty batteries, starters, alternators and heaters plus stainless steel exhaust systems make every Tacoma a dependable partner – even in Canadian winters. The Tacoma’s suspension system delivers off-road driving confidence, while providing a surprisingly comfortable ride on the open road. All Tacoma models feature an independent double wishbone front suspension with gas shock absorbers, coil springs and a stabilizer bar, plus a leaf spring rear suspension with gas shocks. 4x2 Tacoma models feature rear-wheel-drive, while 4x4 models feature on-demand 4WD with an auto-limited slip/auto disconnecting rear differential, two-speed transfer case, and one-touch 4WD control with in-cabin indicator, making it easy to switch between RWD and 4WD, even on the fly. Safety is always standard on a Toyota, so every 2015 Tacoma features six airbags plus Active Front Headrests with Whiplash Protection, tether anchor points for child seats and a direct tire pressure monitoring system. As with every new Toyota since 2011, the 2015 Tacoma is also standard equipped with the six active safety technologies of the Star Safety System: Antilock Brake System, Brake Assist, Electronic Brake Force Distribution, Vehicle Stability Control, Active Traction Control and Smart Stop Technology work together to help drivers avoid potential accident situations. All models are generously equipped with comfort and convenience features, including: a six-speaker, 6.1” display audio system with integrated Bluetooth connectivity, voice recognition, and auxiliary audio and USB inputs; air conditioning; power door locks; power windows with driver side auto-down function; a tilting/telescoping steering column; plenty of thoughtful in-cabin storage; 12-volt accessory power outlet; dual exterior mirrors; rear step bumper; removable tailgate; tie-down cleats; a double-wall, composite cargo bed; 3,500 or 6,500 lb towing capacity (engine dependent); and more. The 2015 Toyota Tacoma 4x2 Access Cab – with the thrifty yet powerful 4-cylinder engine and a choice of five-speed manual or four-speed automatic – has room for four adults plus a six-foot cargo bed, and comes with 15” styled steel wheels and a full-sized spare tire. New for the 2015 model year, all Tacoma 4x2 Access Cab models are now standard equipped with: rear privacy glass; sliding rear window; cruise control; keyless entry; and a leather-wrapped steering wheel. This fuel-efficient model features a combined city/highway rating of just 10.5/100 KM (manual) or 11.2L/100 KM (automatic) – making it the category winner in the Natural Resources Canada fuel efficiency awards for the fourth-straight year. The 4x2 Access Cab may be enhanced with an available SR5 Power Package, which adds: LED brake lamps; front passenger seat fold-down seatback; driver’s seat lumbar support; SR5 grade cloth seats; a back-up camera; colour-keyed front bumper; chrome rear bumper and front grille; dual illuminated vanity mirrors; power-adjustable exterior mirrors; variable intermittent wipers; leather-wrapped shift knob; metallic dash accents; and a 120v/400w power outlet in the cargo bed. The 2015 Toyota Tacoma 4x4 Access Cab features the 2.7-litre four-cylinder engine plus a choice of five-speed manual or four-speed automatic. The Access Cab provides comfortable space for four adults while a six-foot bed offers loads of room for gear, and this model comes with 16” styled steel wheels and a full-sized spare tire. New for the 2015 model year, all Tacoma 4x4 Access Cab models are now standard equipped with: rear privacy glass; sliding rear window; cruise control; keyless entry; and a leather-wrapped steering wheel. This fuel-efficient model features a combined city/highway rating of just 12.3L/100 KM (manual) or 12.3L/100 KM (automatic). The 4x4 Access Cab may be enhanced with the SR5 Power Package, which adds: 16” aluminum alloy wheels with locks; a back-up camera; power adjustable exterior mirrors; LED brake lamps; front passenger seat fold-down seatback; driver’s seat lumbar support; SR5 grade cloth seats; colour-keyed front bumper and fender flares; chrome rear bumper and front grille; dual illuminated vanity mirrors; windshield shade band; variable intermittent wipers; leather-wrapped shift knob; and metallic dash accents. The 2015 Toyota Tacoma 4x4 Access Cab V6 features the 4.0-litre V6 engine plus a choice of six-speed manual or five-speed automatic. The Access Cab provides comfortable space for four adults while a six-foot bed offers loads of room for gear. 16” Styled steel wheels include a full-sized spare tire. Standard convenience and comfort features include: A sliding rear window; rear privacy glass; steering wheel-mounted audio controls; keyless entry; cruise control; and power adjustable exterior mirrors. This powerful model features a combined city/highway rating of 13.4L/100 KM (manual) or 14.0L/100KM (automatic). The SR5 Power Package adds: 6,500 lb towing capacity plus trailer sway control system, 7-pin trailer wire harness and Class IV weight distribution hitch; an engine oil cooler; a transmission cooler (automatic models); upgraded alternator; 16” aluminum alloy wheels with locks; LED brake lamps; driver’s seat lumbar support; front passenger seat fold-down seatback; SR5 grade cloth seats; back-up camera; digital compass; chrome grille and rear bumper; colour-keyed front bumper and fender flares; dual illuminated vanity mirrors; auto-dimming rear view mirror; integrated garage door opener; variable intermittent wipers; leather wrapped shift knob; metallic dash accents; and illuminated entry. The TRD Offroad Package builds on the SR5 Power Package, adding: Active Traction Control system; rear differential lock; fuel tank and transfer case protector plates; Bilstein shock absorbers; unique raised white letter 16” all-terrain tires; front sport seats, water-repellant seat fabric; TRD decals; 120v/400w power outlet in the cargo bed; and fog lamps. Models with the automatic transmission also receive Downhill Assist Control and Hill-start Assist Control systems. The 2015 Toyota Tacoma 4x4 Double Cab V6 features the 4.0-litre V6 engine plus a choice of six-speed manual or five-speed automatic transmission. The Double Cab accommodates five adults. The automatic features a six-foot bed, while manual models come with a five-foot bed. 16” styled steel wheels include a full-sized spare tire. Additional standard convenience and comfort features include: rear seat heater ducts; driver’s seat lumbar support; front passenger seat fold-down seatback; a 60/40 split fold-down rear seat with under seat compartment; a sliding rear window; rear privacy glass; steering wheel-mounted audio controls; keyless entry; cruise control; and power adjustable exterior mirrors. This powerful model features a combined city/highway rating of 13.4L/100 KM (automatic) or 14.0L/100 KM (manual). The SR5 Power Package adds: 6,500 lb towing capacity on manual transmission models (6,400 lb on automatics) plus trailer sway control system, 7-pin trailer wire harness and Class IV weight distribution hitch; an engine oil cooler; a transmission cooler (automatic models); upgraded alternator; 16” aluminum alloy wheels with locks; LED brake lamps; SR5 grade cloth seats; back-up camera; digital compass; chrome grille and rear bumper; colour-keyed front bumper and fender flares; dual illuminated vanity mirrors; auto-dimming rear view mirror; variable intermittent wipers; leather wrapped shift knob; metallic dash accents; illuminated entry, and more. The TRD Sport Package builds on the SR5 Power Package, adding: Bilstein shock absorbers; 17” aluminum alloy wheels; heated front sport seats with water-repellant fabric; a garage door opener; hood scoop; TRD decals; integrated signal lamps; 120v/400w power outlet in the cargo bed; fog lamps; and more. The TRD Sport Premium Package features all the items in the TRD Sport Package, plus: a navigation system; SMS-to-Speech and Email-to-Speech capabilities; and leather seat surfaces. The Limited Package – available only on models equipped with the automatic transmission – builds on the TRD Sport Premium Package, with the following enhancements: 18” chrome-clad alloy wheels; a premium JBL Audio system with subwoofer; Softex trimmed seating; chrome rear bumper, exterior mirrors, grille, fog lamp surround, door handles, and side step bars; colour-keyed front bumper; and Limited badging. The 2015 Tacoma 4x4 Double Cab V6 may also be enhanced with the Trail Teams Sport Package, which adds: unique black side-step bars; TRD exhaust system; front skid plate; roof rack with cross bars; and Trail Teams Sport decals. 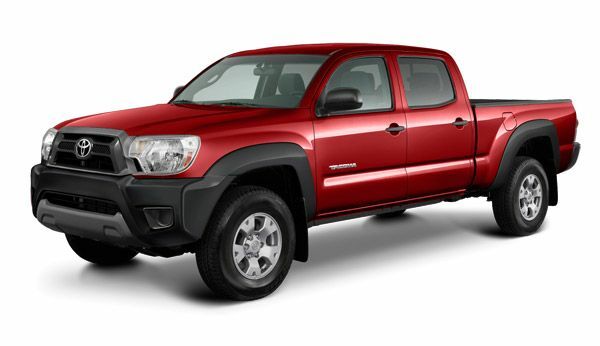 The 2015 Toyota Tacoma is now on sale at Toyota Dealers across Canada. For more information on features and specifications, visit www.toyota.ca/tacoma. * For more details on awards won by the Tacoma (and other vehicles) visit www.toyota.ca/awards.